Farro is a whole grain that has long been used in Meditarreanean cooking. 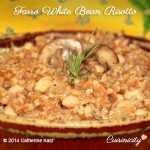 Its nutty richness blends beautifully with the white wine and small beans in this simple risotto and the addition of organic soy milk gives it a rich creaminess. I think of this risotto as a protein-rich side dish with Grilled Veggies or sautéed mushrooms, spinach, kale, red chard, butternut squash, the list is endless, whatever you grow in your garden-I leave it to your imagination! All you need is a great big mixed greens salad, and you got yourself a complete dinner! Scroll down to the bottom of this post to check out my new feature #cookwithCuisinicity where I share little video clips of cooking this yummy recipe with you in my own kitchen at the bottom of this post! Cuisinicity Tip: I like to use a very favorful cheese, such as Gruyère de Comté or Manchego cheese (you can also use smoked mozzarella) because I use it very sparingly--1/3 cup is all it needs-- to give it the richness. To keep it vegan, use a non-dairy cheese of your liking. Sautee the onion and garlic in olive oil in a large shallow pan for a few minutes until soft. Add dry farro to the pan and stir with a wood spoon to coat with the olive oil well and continue to cook for a couple minutes. Turn down the heat a little and add the wine (it will sizzle--I love that sound!! ), water and salt and simmer, covered for 15 minutes. Stir in the soy milk and beans and continue to simmer uncovered for an additional 10-15 minutes, or until most of the liquid is absorbed (some of it left is good as it will blend with the melted cheese-yum!). Turn off the heat and add the cheese and ground pepper, stirring gently to blend and sprinkle with a little fresh rosemary. I love this recipe already for some time… Today however was the first time I convinced my 21 month old to try it. Well she ate up her full plate and continued with most of mom’s ? I love this recipe. Have you ever considered adding nutritional information to your recipes? It would be helpful. Hi Lorie! Thank you so much for the kinds words! Yes, I have thought about to bit decided against it, as I explain here: http://cuisinicity.com/calories-in-calories-out-but-dont-obsess/ I hope this is a little helpful! I made this tonight and it is ABSOLUTELY DELICIOUS!!! I am embarrassed to admit that I have never used farro – but this is going to be a staple in my kitchen going forward. Thank you for creating such wonderfully delicious AND nutritious dishes, Catherine. Pure magic!! Thank you so much Martha!! What a lovely comment! I LOVE it!! I made this today and we loved it. 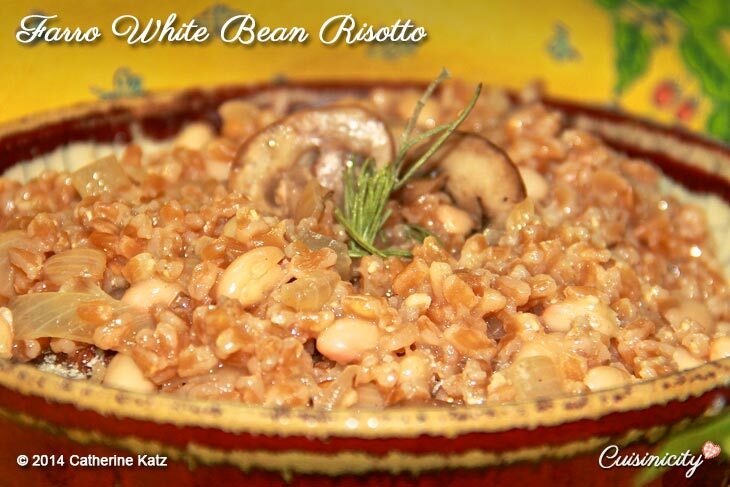 So healthy using high protein farro and replacing some of the carb with white beans. Will definitely be making it again! What a sweetie, Barbara! Thank you for taking the time to add your stars, I am so touched! I am delighted that you loved it. It’s my go-to protein-filled side-dish on veggie nights too! Oh my goodness, John, I could NOT ask for a better compliment! I especially love it when kids love my recipes! Please let me know what other recipes they love. I am actually thinking to do a blog on all the tricks I use to “hide” all these good ingredients our little picky eaters would not even look at, but devour when done just right! So Thank you for this terrific comment! Will do, Catherine. I face challenges getting teenage kids to eat well, so I do all the cooking in my house. My fridge has turned into a Cuisinicity. Changing their taste preferences started very early (as toddlers) when they refused to eat their vegetables. So, I responded by making them ‘green frosties’ – smoothies containing spinach. Evil, but true – but anything to make eating vegetables fun. My daughter is 13 years old now and loves singing opera, classical and jazz music. My next stop on the Cuisinicity journey is those whole white wheat pancakes is see Gabe consuming in the photo – when a teenage boy gives me the thumbs up, I pay attention! Onward…. You are an inspiration! Good for you! And wow your 13 year-old singing opera, classical and Jazz, that’s impressive! I think you are going to love my blog next week, it will be all about me being a “Stealth Mom” sneaking all these nutritious foods into classic kid dishes! I can’t wait for your teenage boy to try these pancakes– outrageously delicious ! Send me a picture of your kids eating them with the thumbs up IF they indeed love them (it has to be genuine!!) and I promise I will post right by Gabe’s picture! Tried this recipe for the first time today. My kids love it! I’m breathing much easier these days with doable (after work) healthy choices that motivate picky kids (with North American taste buds) to eat well.